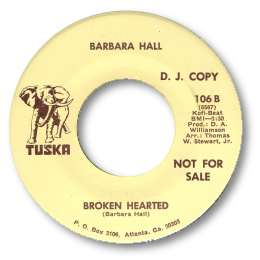 Barbara Hall first recorded for the legendary Tuska label in Atlanta in her home town. 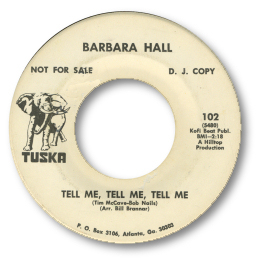 I like both bluesy midpaced R & B sides of her debut single with Tell Me Tell Me Tell Me just edging it thanks to a better melody and fine horn chart. Even at this stage you could tell she was a class act – her tone confident with an occasional “raspy” phrase, with just enough of Aretha’s sound to set it all off. But her second self-penned 45 Broken Hearted is an ode to despair which has captivated all who have heard it - and no wonder as it's a beautifully realised number superbly topped off by her desolate delivery. Quite brilliant. The typically sensitive arrangement was by Georgia maestro Tommy Stewart. The Tuska 45s probably came out at the end of the 60s/beginning of the 70s to judge from their style - particualrly the "wah wah" guitar (Freddie Terrell?). By 1974 she was cutting for Innovation II under the production hands of Major Lance and Otis Leavill. And while the first single for the label was competent orchestral soul with the ballad “Can I Count On You” being the better side, her second was just genius. Drop My Heart Off At The Door is one of the best deep soul cuts of the decade, an emotionally charged tour de force. After a short rap Barbara gives a vocal performance of exceptional maturity and strength, particularly when she raises the temperature with the occasional scream. Terrell’s guitar work is beautifully judged as is the string section and subdued background harmonies. 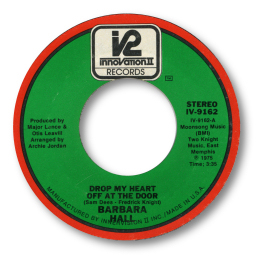 All this of course is based on an outstanding Dees/Knight song but with this effort Barbara Hall joined a very select band of those singers – including Bill Brandon and Rockie Robbins - who added something new to a Dees composition. And please don’t let the dance crowd convince you that “You Brought It All On Yourself” is the track to listen to. Her final release for the West Coast based Debut concern showed that her voice had lost nothing of it’s power or authority but the synths on the ballad “Come See About Your Girl” rather detract from the full listening pleasure of her singing. Sadly Barbara passed away late in 2006. Yet another singer of quality whose luck sadly didn't match her talents. You can read Colin Dilnott’s views on Barbara Hall in his excellent blog here. Thanks to Marten Tonnis for the date on "Broken Hearted".